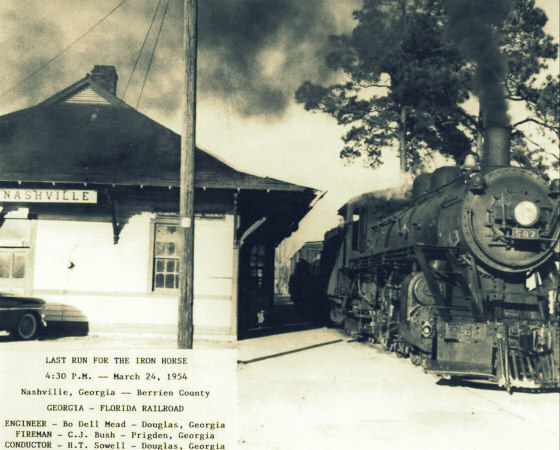 On March 24, 1954 engine number 507 was the last steam locomotive to make the run down the line of the Georgia & Florida Railroad which passed through Ray City, GA. The train, photographed below at its last passage through Nashville, GA,was manned by: Engineer Bo Dell Mead, of Douglas, GA; Fireman C. J. Bush, Pridgen, GA; and Conductor H. T. Sowell, of Douglas, GA. In Ray City, there was was the big wooden water tower which provided water for the old steam engines. This tower stood just south of Main Street,on the east side of the tracks, next to Marvin Purvis’ Grocery Store.